You love the outdoor sports. You know that there is nothing better that spending your day outside. Taking your adventures to the water is a natural way to improve your fitness and happiness. You may already have a kayak but are looking to bring a friend or pet on your trips with you. A tandem kayak is an excellent way to do this. Having an extra seat and higher weight capacity allows you to bring anyone you want with you on your journeys, but make sure you get the best tandem kayak available. Alone time is great but being able to enjoy a day on the water with your family, a friend, or even your pup will make your time even more memorable. We have found the top five double kayaks on the market to help you do just that. A fisher’s paradise, this is the best two person kayak that has everything you will need for a day on the lake. With three fishing pole holders and holders for your paddles, your hands will be free to hold a nice cold drink. This heavy duty rigid board is incredibly durable and can handle rough everyday use with grace. 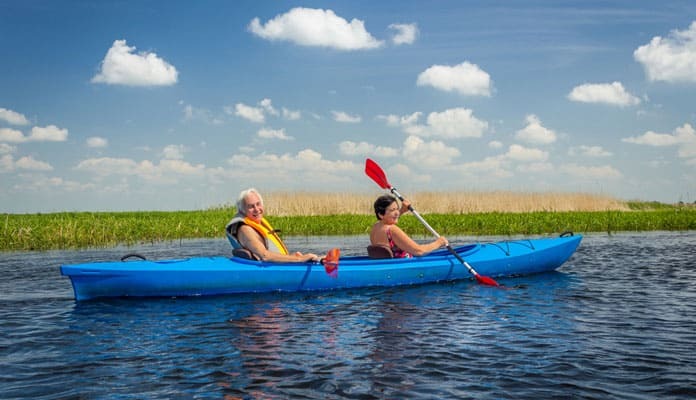 Lifetime is so confident in its double kayaks, they are even attaching an impressive five year manufacturer’s warranty to it so you will feel good at this purchase. A plush padded seat will allow you to spend even more time in the water sitting comfortably. Storage everywhere, the interior storage hatch gives you tons of space to stash your gear out of the way and keep it safe. Bring a friend, or even two friends, on your next adventure with this spacious design coming with different heights of foot rests. This means that no matter your size, you will be comfortable. This company produces high-quality kayaks, often found to be top rated tandem sit on top kayaks. 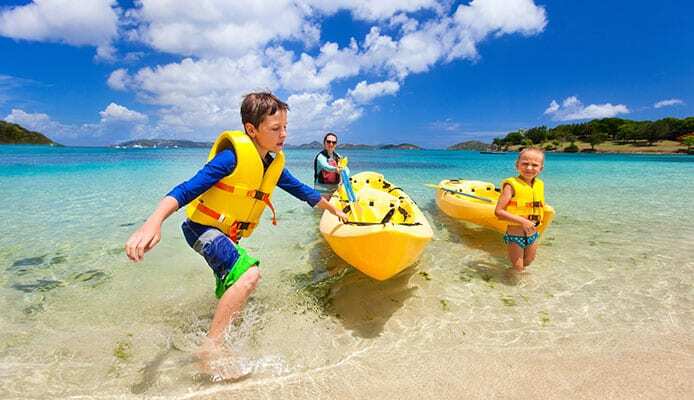 A popular choice among families, kids love the banana look of this inflatable tandem kayak. The bright yellow design offers increased visibility and adds to the safety. 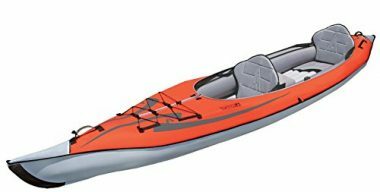 This Intex Explorer K2 kayak is the best double kayak that was built for expert use in lazy rivers and lakes where the water is more still. With removable seats you can alter this two person kayak to fit your needs perfectly. The seats being inflatable mold to the shape of your body making them even more comfortable and allowing you to use them for long periods. Whether you are bringing a partner or going solo, this double kayak will be easy to maneuver expertly gliding over the water. A lightweight design allows you to easily transport this boat from your car or portaging between lakes. The low profile design makes it incredibly stable and thus great for use with beginners. It also comes with a removable skeg, also known as a fin, which helps it with direction so that it can glide through the water in a straight line with ease and grace. This attractive sporty looking kayak excels in still water. Bringing it out for a day on the lake or on a calm river and watch as it performs expertly. With a large nose, this two person kayak devotes it fully to storage space so you can pack even more with you on your next adventure. As this is a mesh cargo bay, we recommend popping your gear into a dry bag to ensure it stays dry and pack all you need for your next adventure. Even coming with a dedicated water bottle holder, you can now bring your favorite beverage with you on the go. 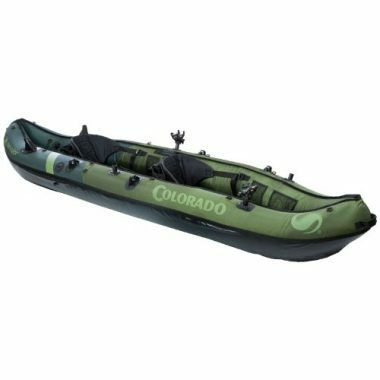 This is the best tandem inflatable kayak that has a backrest that forms to your back giving you a comfortable seat while a spacious cockpit will allow you the room to move around with ease. Incredibly durable, this boat is constructed with heavy duty puncture resistant vinyl which leaves you with more peace of mind. Riding much like a rigid board, this inflatable double kayak is incredibly stable and even has double welded seams which is guaranteed to hold much stronger than traditionally used glue. Coast guard approved, this UV resistant boat is sure to pass the test of time. Bring your pup with you, his claws are no challenge for this incredibly durable inflatable two person kayak. Bring a friend, or two, with this boats impressively buoyant weight capacity. Take this double kayak with you just about anywhere. On a still lake or through the unexpected ocean surf, this Sea Eagle SE370 inflatable kayak is the best 2 person kayak that is equipped to handle it all. With a spray skirt, glide over the surf or through the white caps without getting soaked as it expertly catches the spray. Pack your cargo with you and watch as this inflatable double kayak is comfortable and easy to use even for extended trips. Don`t worry about the material fading or cracking with extended use. With a UV resistant material, it ensures that this kayak will stay looking great for longer. This will keep the integrity of your 2 person kayak and allow it to perform for years to come. It is also saltwater resistant allowing you to take this sport with you wherever you go. This is the best tandem inflatable kayak packaged set comes with everything you need to get into the water and stay in it. Our favorite is the carrying case that keeps everything compact enough to fit in the trunk of your car. 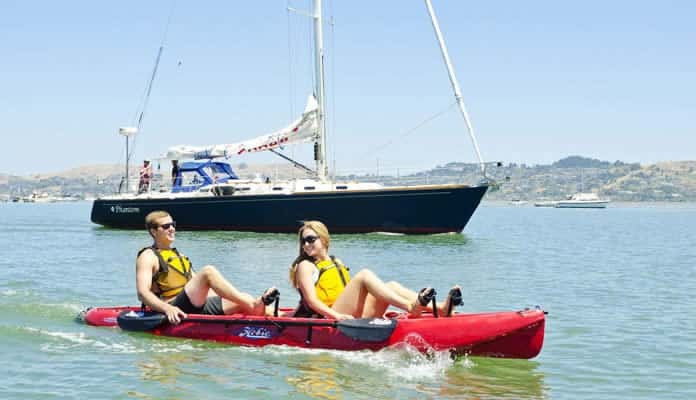 Ocean Kayak Malibu Two tandem kayak is the best tandem sit on top kayak for the entire family. It’s 425 lbs carrying capacity can hold 2 people plus a pet or child as well. You get all this with only a 57 lb package. There are 3 seating positions that range from the bow to stern to middle which allow you to find the right spot no matter how many people are with you. The footwells are also longer and allow even the tallest people to fit comfortably. The Brooklyn Kayak Company makes some of the best tandem sea kayak on the market. Their UH-TK219 model has enough space to hold up to 3 people (or two people and a child or dog). You’d expect a kayak with this capability to be heavy, but not this one. It weighs just 70 lbs - not a small feat for a kayak loaded with as many features as this one. You should also be excited about what’s included in this package. Instead of simply throwing in low quality paddles this package comes with aluminum 2 piece lightweight ones. The included seats are also top of the line. They are completely adjustable and removable so you can make this into a single kayak with ease. The front seat is placed almost perfect in the center of the boat which allows you to have full control of the kayak. There are 2 cargo hatch areas as well. Each seat has their own compartment so they can store their own gear. There’s also a rear cargo storage area with bungee tie down system. You’ll also love the 2 bungee paddle holders which allow you to have your hands free. This is one of the best tandem inflatable kayaks on the market. Unlike others this Advanced Elements option has aluminum ribs that make it feel and ride like a rigid option. This makes the stern and bow nearly rigid which allows you to track nearly perfectly through the water. The material used in the construction of this 2 person kayak has 3 layers which make it puncture resistant. All you have to do to get this sailing ready is unfold it and inflate it. Don’t think that because this is an inflatable that they skimped on the comfort. The seats are incredibly comfortable with a higher support area making them great for taller people. They are also able to be moved to 3 different locations depending on how many people are using the kayak. Even though this is an inflatable kayak it still has a very open cockpit. You are able to move around on the deck without feeling like you’re stuck inside. Since this is such a long two person kayak (15 feet in length) it has loads of storage space for your gear. There is a bungee system that you can strap your waterproof duffel bag to. You’ll also be happy to know that this comes with everything you need to get in the water. It comes with a carrying duffel bag, 2 folding seats, a repair kit and the owners manual. This may be the best 2 person sit on top kayak on our list. Sevylor has made one of the most outrigged inflatable kayaks available. The Coleman Colorado is made from an 18 gauge PVC material that makes it one of the toughest constructions. It also has a 1000D tarpaulin bottom and an 840D nylon cover that makes it durable enough to prevent punctures. 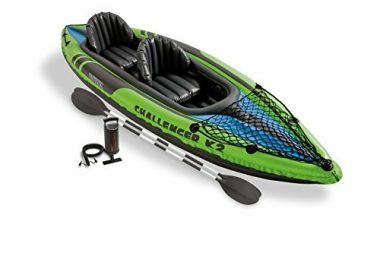 This 2 person kayak even has multiple air chambers that ensure you stay on top of the water even if one somehow gets punctured. This is also one of the best inflatable tandem kayaks. It has many rod holders built in so that you can fish without always having to hold onto your rod. If you have a trolling motor you can also attach it to the pre installed mounting area on the two person kayak. There are also paddle holders that allow you to secure your paddles without struggling to ensure they stay on your lap. Mesh storage pockets are strategically placed throughout the 2 person kayak so you can keep crucial gear within arms reach at all times. Vibe Kayaks 3 person sit on top kayak also makes an excellent fishing kayak. It is a 12 footer that handles like a smaller boat. 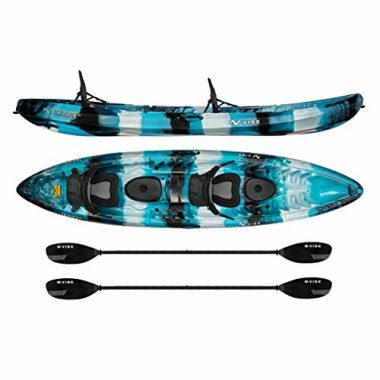 Vibe Skipjack 120T kayak has a 500 lb weight capacity making it great for the entire family. If you enjoy fishing this is the best tandem fishing kayak for you. There are multiple rod holders with loads of storage options. You get 2 sealed hatches with a bungee system and even cup holders for your drinks. Brooklyn Kayak Company also makes the best tandem beginner kayak. The UH-TK181 model excels at everything it does. It is made from some of the highest quality material on the market which means it’ll last longer than its competition. In fact, there are 7 fishing rod holders, 3 of which are adjustable. This is one of the most you’ll find even on dedicated fishing kayaks. 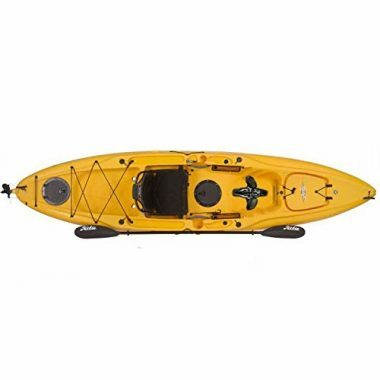 This two person kayak also has great options when it comes to storage and added features. There are two dry hatches that can store things like wallets, phones and keys. Paddle rests will also eliminate your paddle from floating away from you. 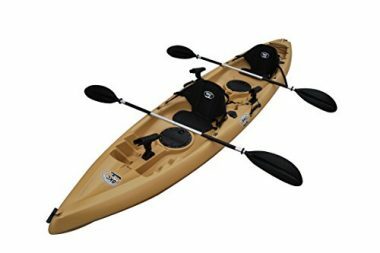 This is such a well made 2 person kayak that Brooklyn Kayak Company includes a 5 year warranty with the purchase of this kayak. Advanced Elements are great at making inflatable kayaks. The Lagoon 2 is the best tandem kayak that has a well thought out design. It’s versatile and can be used in any body of water including lakes, rivers, bays and more. What makes this boat so great is that it has built in rigid panels that help it track through the water. It also has a quick inflating spring valve which makes getting onto the water a breeze. The seats used in this 2 person kayak have extra padding that contours to your body. This makes your time on the water more comfortable. Since the material is a high quality polyester rip stop with a PVC laminate you can be hard on this two person kayak without worry. There are also multiple air chambers so you will be safe even if one fails. Getting this two person inflatable kayak to the beach won’t be an issue as it only weighs 37 lbs. It can also fold up to fit in your car's trunk and a small closet. This makes transporting and storing it a breeze. Sun Dolphin is a leader in the kayak industry. They have the knowledge and experience to make excellent kayaks. The Bali 13.5 Foot Tandem Kayak is a prime example of this. It can fit up to 3 people and carry up to 500 lbs. This is the best tandem touring kayak that excels at storage as it has 3 covered options to choose from. It also has on board shock cord deck rigging that can store all of your larger gear. It is also a comfortable boat as it comes with adjustable foot braces and padded seats with high backrests. There are multiple positions for the seats and you can even use this 2 person kayak as a single option. 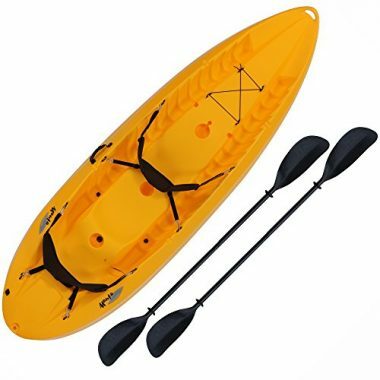 Cruise through the water with this kayaks sail mount, head out to the lake for a fishing trip resting your paddles on their paddle holders or allow it to take you out for an extended trip, this double kayak does it all. A covered bow hatch gives you tons of space to store your cargo. 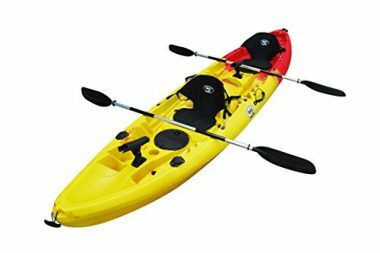 This 2 person kayak is so sturdy, you can easily stand aboard to cast your fishing line or for a different paddling experience. Space isn’t of a shortage in this tandem kayak, it is built with comfort and storage in mind expertly designing enough space for you and your gear to be comfortable. While this 2-person kayak may not offer two seats, we included it as it has an impressively high weight capacity and a large surface area which makes it perfect for transporting your pup around with you. There are key features to look for when looking to buy the top rated tandem kayak and we have listed some must haves here. There are many different types of materials that a tandem two seater kayak can be made of. This is directly related to the weight and durability of the rig. Polyethylene is a plastic material that is commonly found in a kayak. It is a durable material that is also lightweight. It does a good job at absorbing impact and does not scratch easily. This makes it an easy choice for the hull which routinely comes in contact with sand and rocks along the shore. But it does have its drawbacks. We suggest keeping it out of direct sunlight as it can warm and become brittle over time. If you keep this in mind and not subject it to the elements your tandem two seater kayak will last for years to come. Composite is a mixture of high end material. The fiberglass, Kevlar and carbon concoction creates a strong material that will stand the test of time. An added bonus is that these are exceptionally lightweight materials. Just be careful when launching and landing this tandem kayak type as the materials are more easy to damage than its polyethylene counterpart. This material is quite easy to repair but can be a hassle to find a shop. Believe it or not, inflatable two person kayaks have come a long way over the years. The material has become strong, even puncture resistant, and feature military grade PVC or high-quality Denier material. These are ultra portable usually folding into a small backpack. There are many air compartments that ensure you make it back to the shore even if you spring a leak. The hull shape will determine how the two person kayak performs in the water. There are three main shapes of these boats. These are usually found on beginner boats. The flat bottom allows the maximum stability in calm conditions. It is not recommended to take this type of hull into rough or ocean conditions as they will not be able to cut through the surf. Having a rounded bottom allows these ships to cut through the water. This makes them faster than their flat shaped cousin. Also, it will take less effort to get up to speed since there is less friction against the water. It gives up a little stability from the flat bottomed kayak, therefore this type is recommended for intermediate riders. A V-Shaped hull will propel you at the fastest speed and is good for long distance travel. Even though they are the least stable they offer secondary stability. This means they can be saved when they are tipped on their side. These types of hulls will be able to turn on a dime and be maneuvered easier than the other two types. They should only be used by expert kayakers. Every single kayak has a different weight capacity. Tandem two seater kayaks will range from 400 to over 800 pounds. Factors that determine this limit include how many people are riding in it, and the amount of gear you are carrying. The materials used to create the tandem kayak plays a key role in determining the riding capacity. The weight of these top rated tandem kayaks varies from 30 to 100 pounds. The features and construction can add and decrease weight. For example, a rigid polyethylene kayak could weigh double that of an inflatable. The length will also be something that dictates the abilities of the tandem kayak. A longer boat is harder to maneuver but is better at handling large waves and keeping a line. A shorter tandem kayak will be easier to turn and control but are not the best for long journeys. Why Choose A Tandem Kayak? Of the many styles to choose from a tandem two person kayak is one of the better options. Not only do you get tons of storage but you also get to bring along a friend. This is particularly useful for families and those with young children. This will allow you to bring your child along with you in the kayak and allow them to build their confidence. Tandem kayaks are also often quite a bit longer than solo kayaks making them move faster in the water cutting through at a good speed. Sit On Top Or Sit Inside Tandem Kayak? When you choose one of the top rated tandem kayaks, you will notice that there are two different styles of kayaks for you to choose from. This is your sit on top and your sit in kayaks. For sit on top tandem kayaks, you will find both of these styles available for both your solo and tandem kayaks. You may think that these types of boat are only made of hard plastic but you also do get them both in inflatable boats as well. These kayaks, while they have many differences, share many of the same characteristics. In both kayak designs, you refer to the bottom of the kayak as the hull and the top of the kayak as the deck. As with other watercrafts you still refer to the front of the boat as the bow and the back as the stern. In both styles of boat you will find the deck of the boat covered in bungee lines allowing for maximum storage. Both boat styles will also feature a seat and foot supports. Of course, there are many differences as well. Sit inside 2 person kayaks have an enclosed cockpit that allows riders to sit lower in the water. As the name suggests you sit on top of your sit on top kayak which gives you a significantly higher center of gravity. Sit inside kayaks always come with some sort of backrest in their seating area as well. Choosing the style of tandem kayak that is best for you may not be as straightforward as you are thinking. There are many benefits to both types of kayaks that should all be considered before making your choice on one. To start with, you may want to ask yourself a few questions. These should include determining the type of water you are going to be paddling in as well as the temperatures of the water. From here, consider the pros and cons of each 2 person kayak type. Sit on top kayaks are generally the most user friendly as they are very easy to get in and out of. They tend to deliver a stable ride giving you a very freeing feeling as you are not confined in a cockpit. This kayak style does not have any protection in the water and guarantees you to get wet. Luckily these boats come equipped with self-bailing features which allow you to stay safe. This does however mean they are designed solely for warmer waters. This type of kayak is incredibly easy to get in and out of making them ideal for paddlers looking to swim. Sit inside kayaks give you a place to lower your body into making them much warmer for your body. Providing a shelter from wind and rain these kayaks are ideal for paddlers in cooler waters. Due to this protective shell you are far less likely to get wet in this style of kayak and therefore can paddle while wearing a full outfit of clothing. They offer a great amount of stability but unfortunately do not have the same amount of freedom to move in and out of the water as their sit on top partners. There are many advantages to choosing a tandem 2 person kayak. The biggest advantage is the ability to carry more. With a larger weight capacity you are able to bring along more gear and more people or both. With this added space you can even bring your furry friend along for the ride. As these boats are often much longer in size you will even be able to enjoy a better performance. This is due to the long and slender shape of the kayak that allows you to cut through the water with ease. Having the ability to carry two paddlers on board also means that you will have double the paddle power. Below, we explore the many advantages of opting for this type of tandem kayak. Young kids will love this style 2 person kayak. They can sit on the deck without feeling like they’re going to fall off. Tandem kayaks will have enough space so you can watch your kid to ensure they stay safe. You can take the rear seat and give them the front one. This allows you to paddle while they just sit there and take in the scenery. There are also boats that will allow you and your partner to have seats with enough room for a youngster to sit between you. This may not be ideal for long commutes but a short boat ride will be perfect. Tandem kayaks also give you the ability to bring along your dog. Most are made of a hard plastic material which won’t get damaged by their paws. A tandem kayak with removable seats will be ideal so they have room to sit and move around without tearing up the seat. We recommend bringing along a blanket for your furry friend so they will be more comfortable. This will also provide a barrier between the tandem kayak and your pups sharp nails. It is important to consider safety before bringing your pup along on the water. This isn’t meant to be a stressful situation so deciding whether your dog is mentally fit to handle this is important. You will also want to pack for your furry friend as well. You will want to provide them with plenty of water along the trek. This includes a safety life jacket. Even strong swimmers can struggle to get their bearings in deeper waters. It isn’t worth your dog’s life so be sure to always have them wearing a safety vest. Be sure to always consider how much heat your dog is being exposed to as well. Some dogs really do not have a strong resistance to heat. Being able to go on trips with a partner will allow you to rest without losing time. You can trade off shifts so both of you get a chance to paddle without getting too tired. This is also ideal for people who love nature photography. The person sitting at the front of the kayak can snap some pics while the person at the back can continue paddling. Double the paddle power means that you will have a lot more speed. Tandem kayaks are a great way to go if you are looking to pick up maximum speed in the water. The longer boat cut through the water easily and quickly. While this type of tandem 2 person kayak is generally a bit wider, specifically through the stern, the dual paddling power works to make these boats travel much faster through the water. While you may not always be looking to tear through the water at top speeds, this boating style is much more efficient. That means that you can take it a lot easier when paddling with a friend if you are looking to go at a leisurely pace. The stability found in tandem kayaks is superior to that found in many other types of kayaks. This is a key feature specifically amongst novice paddlers. This is why teaching children with this type of kayak can be incredibly beneficial. Tandem kayaks are a great way for kayakers to gain experience and confidence in the sport. Stability is an important feature to consider, even for more experienced paddlers, when heading into choppy waters and those with a current. This type of kayak allows you to bring along more gear than a solo kayak. On average tandem kayaks offer around 50% more storage then standard solo kayaks allowing you to pack along more gear. While this is a desirable feature you will still want to pay close attention to your boats weight capacity. Kayaks that are weighed down to their weight capacity offer significantly less performance than lighter boats. For those that are packing quite a lot of stuff you will likely have much more success on two solo kayaks than maxing out your tandem kayak. A tandem kayak is a great safety measure that you may not think of. This is especially true when out for longer trips or when traveling with children. 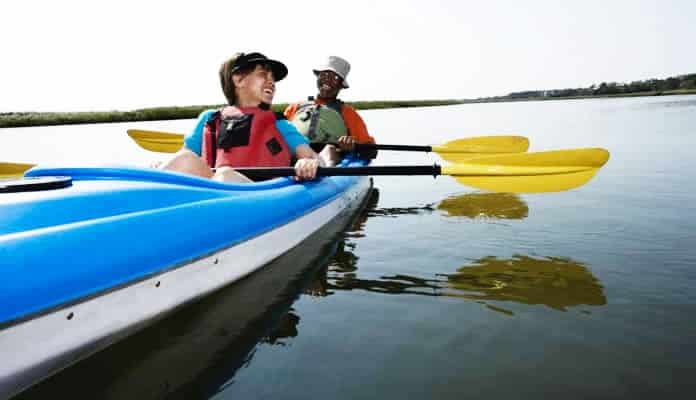 Having a tandem kayak will allow you to have a backup in case of an accident or emergency. In this situation, in the event that someone in your party is tired, ill or has an accident you are able to safely put them in a seat and have the other paddler pull their weight. Having solo kayaks makes it hard to help a friend to safety in the event they are unable to paddle anymore. Having an extra seat in your tandem kayak is a great safety measure and can greatly improve your day on the water. This is especially convenient in the case of kids where they are unable, or unwilling, to paddle all of the time. Tandem kayaks are expertly designed to not only hold more people, but also more gear. These boats are great for the fact that they have a longer much more efficient design. This allows them to not only excel with practicality but also allows them to propel through the water with maximum speed and efficiency. These boats on average are able to hold about 1.5 more storage than a regular solo kayak. This is typically seen through a mix of both internal and on board storage. 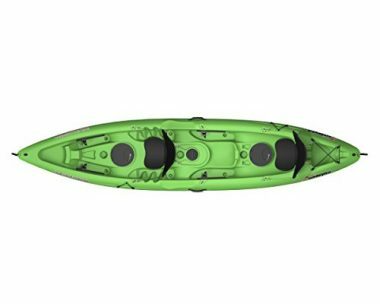 These kayaks are equipped with internal storage in both the bow and the stern giving you all around storage convenience. Tandem kayaks are meant to hold two people and about 50% more storage than regular solo kayaks. That is why these kayaks come in at a much larger size than other kayaks. For this reason, they are quite a bit harder to store. This is also true for transporting your boat. This is important to consider before making your purchase. Having a boat of this increased length will require you to have different equipment to transport your boat and significantly more space for storage. Preparing for this change is important. For those tight on space but still looking for the convenience of a tandem kayak, we recommend opting for an inflatable version. As always it is important to consider your budget when making any big purchases. Most kayaks sit at quite an investment. For this reason it is important to be aware of the costs associated with different styles of boats. Tandem kayaks come with a heavier price tag than most solo boats. This is quite simply because they have double the capacity. While this is true, tandem boats are most often considerably cheaper than buying two solo kayaks. For those looking for a good deal and often travel with a partner, opting for a tandem kayak is a great choice. A: Paddling a tandem kayak takes more effort than a single kayak since you have to be in sync with the person you’re paddling with. To do this the person in the front seat should be the one to set the pace. This will reduce the number of times you bonk paddles (it will still happen, especially when you’re just starting). This isn’t to say the person in the rear doesn’t have any jobs. If the tandem kayak seems to go off course it is the person at the backs job to correct this. They should keep the rhythm but paddle stronger to get the tandem kayak pointed in the right direction. A: Steering a tandem kayak relies almost solely on the person in the rear. The person in the front should keep paddling in their rhythm while the person in the rear is focused on changing the direction. If a couple strong paddles don’t get the job done they may need to try a backstroke. This will get the kayak quickly turned in the right direction. Once the maneuver is done they should time their strokes so that both people are synced backup and paddling in a rhythm. Q: How Long Are Tandem Kayaks? A: This can vary depending on brand and use. A typical tandem kayak can range from 10 to 23 feet. Longer 2 person kayaks will be more stable in the water but can weigh more. Added length can also mean more storage options as well. A: Transporting a tandem kayak is much the same as a solo. There are many roof racks you can buy for your car to get you to the beach safely. Once at the beach you have a lot of options for how to transport your kayak from your car to the water. A common way to do this is through portaging. This becomes easier when you have two people as you can each grab an end of the kayak, flip it over your head and carry it above you. If you have children or are struggling to find an easier way, try investing in a dolly to help you. Q: What Is The Lightest Tandem Kayak? 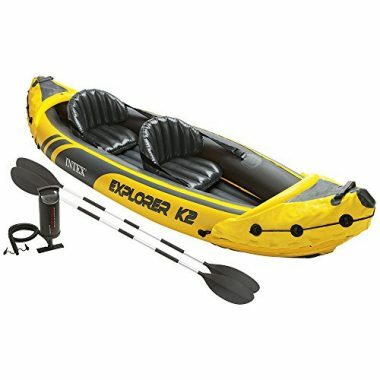 A: The second kayak on our list, Intex Explorer K2 Kayak, Tandem Inflatable Kayak Set, is the lightest of our top picks. 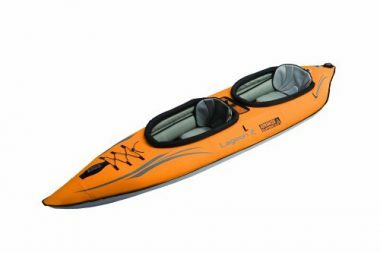 The kayak is inflatable which contributes to its lightweight design and is very durable. As a bonus is a great family kayak. Q: What Are The Weight Limits For Tandem Kayaks? A: As tandem kayaks are designed to hold two people, they have much more generous weight restrictions than regular solo kayaks. 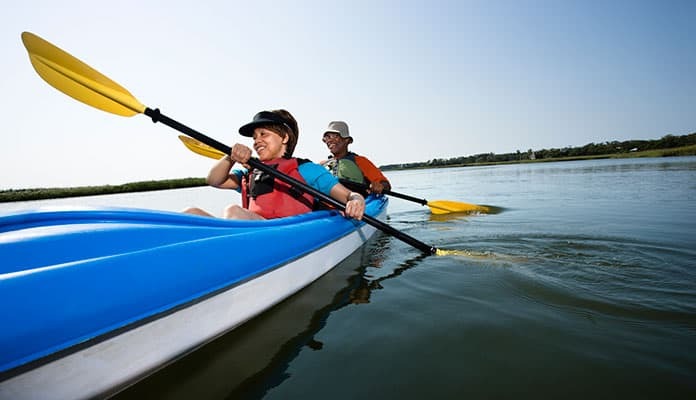 Tandem kayaks typically feature weight restrictions in a range from 400 – 650 pound limits. Depending on your intended use, the weight of you and your partner, and the amount of gear you plan to bring, you can make an informed decision about the best kayak for you. Q: How To Tandem Kayak? A: Kayaking a solo kayak is slightly different from paddling a double kayak for one main reason: you are working with another person. You will need to work with your partner to create a cohesive unit while paddling. The stronger paddler should be in the back of the boat as this person will have the primary job of maneuvering the two person kayak. It is a good idea to have the heavier paddle in the back whenever possible. While you are paddling you will want to try to keep the same paddling timing. This will help you to propel your kayak through the water efficiently with the least amount of correction. A: While tandem boats are designed to be paddled by two different people, at times you may want to take your kayak out for a solo trip. It could also be that your partner is looking to take a break making you the sole paddler in your kayak. If you are paddling a two person kayak solo you will want to ensure you follow a few key pieces of advice. Tandem kayaks will have many different positions for their seats. You will want to ensure that you’re sitting in a seat that is in the middle of the kayak. This will ensure you aren’t tipping the boat when sitting too far forward or in the rear of the kayak. Once you are properly seated you will paddle as if you were in a single seat kayak. Just keep in mind that you’ll have to take extra effort to turn the boat as tandem kayaks are typically longer than single seat options. A: As with any other type of kayaking, it is important to master the art of rolling your kayak. 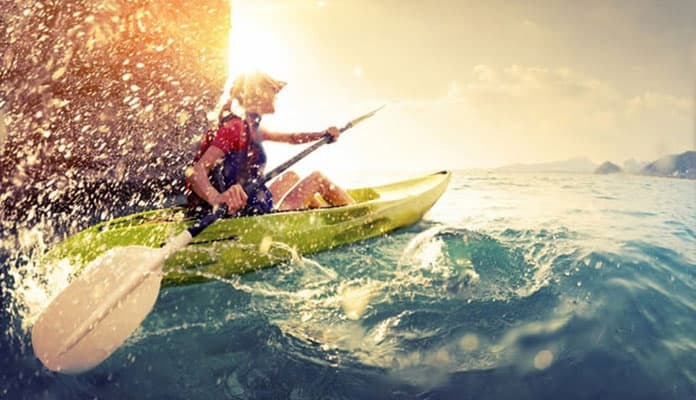 This becomes even more important when using a double kayak as you will not only have to master the technique yourself but also work to coordinate with another person. When practicing your flip, it is important to be on the same page about which way you will want to flip. Make sure to first decide between you which one of you is the stronger one and allow that person to lead. The other one should take the following position in order to mimic the movements and allow you to be successful. This will help you act more synchronized in order to get your movements perfect. Q: How To Pack A Tandem Sit On Kayak? A: When packing a kayak you will generally want to work to balance the weight throughout the kayak quite evenly. When packing the best sit on top tandem kayak you will want to consider the body weight of the paddlers. Make up for the weight variances by distributing the lighter material in the area with the heavier passenger (typically the back). This will help to create a boat that has even weight throughout the whole kayak. A: You will want to store a 2 person kayak the same as a solo one. It is important to consider the fact that this type of boat is often considerably longer than a solo kayak. Investing in a kayak carrier will help to store your kayak up off the floor which makes it quite a bit safer while also taking up less space. For those that have an inflatable kayak, you will have an incredibly easy time storing your boat. For those tight on space, you can store your 2 person kayak outside. Be sure to store it out of direct sunlight whenever possible. This will work to keep your kayak looking new for much longer. Of course, you will want to ensure you always give your two person kayak a good rinse before storing it. Spending your day on the lake is always a good idea. Whether you are going out for an hour, a week or for a fishing adventure, kayaking can do it all. Bringing a friend along for your next adventure will allow you to get even more from this experience. Bring your family, or even just your dog, for a day on the water soaking in the sunshine. A great bonding activity that happens to double as an excellent upper body workout. Tandem kayak reviews agree that having a tandem two seater kayak with a ton of space and a high weight capacity are the key features to look for. Do you love kayaking with a friend? Have one of the best tandem kayaks on our list? Let us know how you like it in the comment section below.